The holidays wouldn’t be the same if it weren’t for festive string lights on homes, businesses, and trees. Around Thanksgiving, folks start putting up elaborate light displays to add holiday spirit to the neighborhood. Unfortunately, hanging lights causes many accidents every year. Read on to learn our tips for safe holiday lighting. The first step for safe holiday lighting is to inspect your sets of string lights for damage before using them. Make sure they are UL-certified for outdoors if you will be using them outside. Look for frayed wires and broken bulbs. If the wires are frayed or the wire insulation is missing on any section, throw away that set. Broken or missing bulbs can be replaced, but make sure you are using a bulb with the same wattage as the others. Plug the lights in to make sure they work before you hang them up, but unplug while you are placing them. Stapling string lights can puncture the insulation on the wires and make a set of string lights unsafe. You can buy Christmas light hooks at any hardware store that either screw in or have an adhesive backing. These are the best options for safe holiday lighting rather than nails, tacks, or staples. 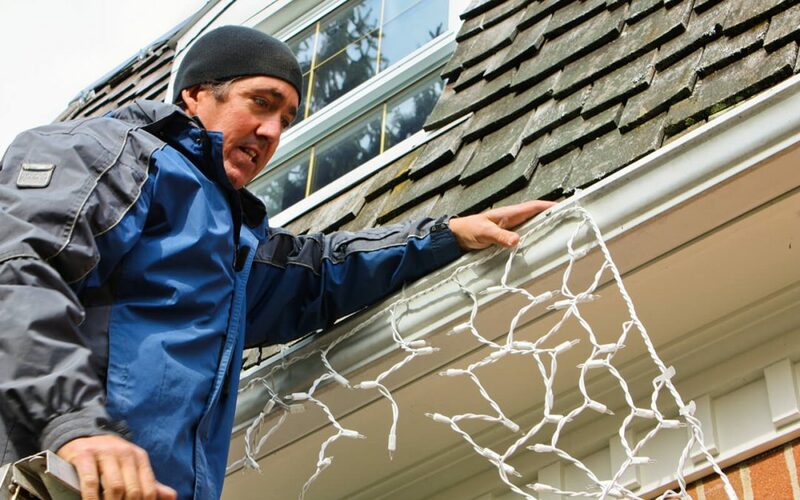 Hanging exterior string lights usually requires climbing up on a ladder, so safe holiday lighting tips include ladder safety. When setting up an extension ladder, place it on dry, sturdy, and level ground, and arrange it at a 75-degree angle from the side of the house. Wear slip-proof shoes and get a friend or family member to help keep the ladder steady and hand you things as needed. One mistake people often make when trying to install safe holiday lighting is overloading circuits with extension cords and power strips. A standard electrical outlet has a limit of how much power it can handle, usually 15 amps. It’s best to load up a circuit to only 80% of its capacity. Click here to learn how you can figure out how many sets of your string lights can safely fit on one outlet. Candles are great for holiday ambiance, but they are not considered safe holiday lighting. Battery-powered electric candles are the safest option to add cozy and festive lighting to your home for the holidays. These faux candles even flicker realistically, and you will never have to worry about them starting a fire. Olde Son Home Inspections wishes you happy and safe holidays. We provide home inspections for Eastern Massachusetts.